Bord na Móna Enriched Top Soil can be used to create beds, borders and raised beds. It can also be used for planting trees, shrubs and in the preparation for laying lawns and maintenance. Top Soil is the upper layer of soil in your garden, it is the fertile and living part of the soil consisting of organic matter and microorganisms which convert nutrients into a form that can be used by plants. It can vary from 5cm in depth to 20cm or more depending on your soil type and garden. Bord na Móna Enriched Top Soil is carefully selected and blended using a number of ingredients to help improve the natural soil in your garden and give you better results. Bord na Móna Enriched Top Soil is ideal for use in beds and borders. Bord na Móna Enriched Top Soil adds nutrients and organic matter to enhance the soil where beds and borders haveshrunk and adds life to tired soils. Bord na Móna Enriched Top Soil should be mixed 50:50 with  existing soil. Bord na Móna Enriched Top Soil is also recommended for new raised beds and can be mixed 50:50 with existing soil or used  on its own. 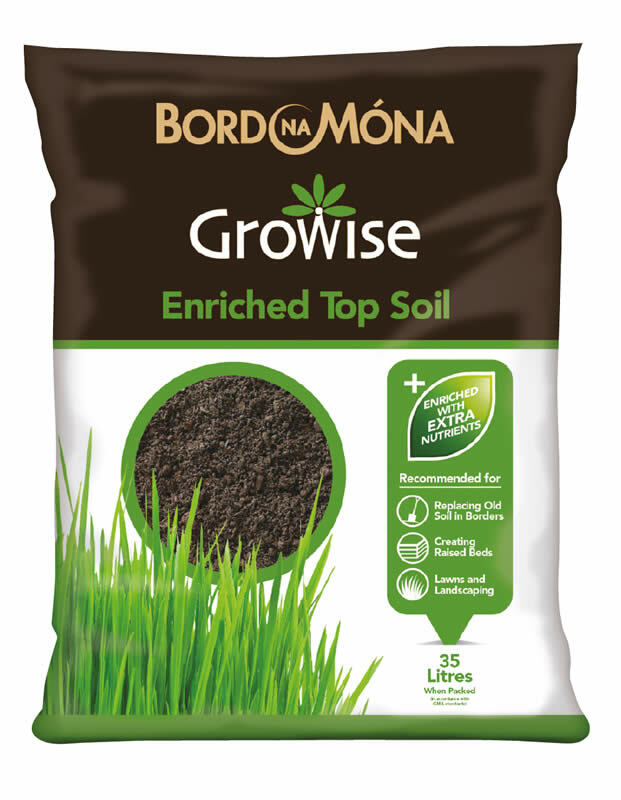 Before laying a new lawn Bord na Móna Enriched Top Soil can be mixed 50:50 into the top layer and then raked to a fine tilth before seeding or laying turf to give an extra boost to a new lawn. Bord na Móna Enriched Top Soil can be used as a lawn top  dressing in autumn. Spread a layer of top soil on the lawn and  lightly rake in. Damage can be caused to a lawn through sports activity, vehicle damage, pets or disease. Bord na Móna Enriched Top Soil can be used in repairing the damaged area. Remove the damaged area and refill with Bord na Móna Enriched Top Soil. Level off and rake to a fine tilth before seeding or turfing. 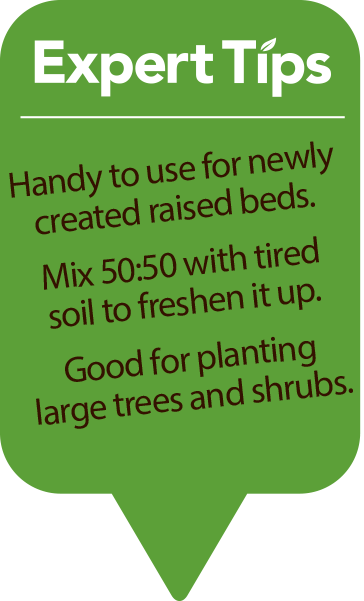 Bord na Móna Enriched Top Soil can be used in a 50:50 mixture with a tree and shrub planting compost when bedding in the plant. The additional nutrients supplied, combined with Bord na Móna Enriched Top Soil will help preserve and retain moisture. Bord na Móna Enriched Top Soil can be used as a compost additive when making multipurpose compost at home. Bord na Móna Enriched Top Soil is recommended at a rate of up to 25% for this  application. In addition to its nutritional value, Bord na Móna Enriched Top Soil helps to retain moisture and acts as a ballast  where pots or containers are likely to fall over in the wind.